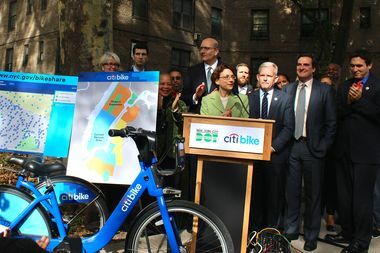 Officials announce the expansion of Citi Bike at the Queensbridge Houses on Oct. 28, 2014. LONG ISLAND CITY — Citi Bike is expanding into Western Queens and new parts of Manhattan and Brooklyn, doubling the number of stations for the bike-sharing program in the city, officials announced Tuesday. The expansion, announced at the Queensbridge Houses, will also mean an increase in the cost of yearly membership for the program, which will rise to $149 from the current $95, according to the announcement. The Citi Bike system will expand from 330 docking stations to more than 700 by the end of 2017, increasing the number of bicycles from 6,000 to 12,000, officials said. The neighborhoods that will host the new bike share stations include Astoria and Long Island City — the first in Queens — as well as Harlem and the Upper East and West sides in Manhattan. A host of Brooklyn neighborhoods are also getting the bike share, including Greenpoint, Williamsburg, Bushwick, Prospect Heights, Crown Heights, Park Slope, Carroll Gardens, Boerum Hill, Cobble Hill, Red Hook, Gowanus and more of Bedford-Stuyvesant, according to the Department of Transportation. The expansion is being funded in part by $30 million from private investors Bikeshare Holdings LLC, which has acquired Alta Bicycle Share, the company that runs Citi Bike. Jay Walder, former head of the MTA, will take over as CEO of Alta, pledging at a press conference Tuesday to improve Citi Bike and address the "frustrations" riders have with the program. "Anyone who uses Citi Bike regularly knows that it should be more reliable, it should be easier to use, and it should be accessible to more of the city," Walder said, saying they plan to overhaul each bike, repair every docking station and hire a vice president for technology. The first of the new bike share stations are expected to start rolling out as early as 2015 in Long Island City, Greenpoint, Williamsburg and Bedford-Stuyvesant, officials said. "We want these blue bikes here as soon as possible," said City Councilman Jimmy Van Bramer, one of several leaders who has been pushing to bring the program to Queens. It was slated to launch in Long Island City as part of the first Citi Bike roll out, but its start there was delayed when equipment was damaged by Hurricane Sandy. 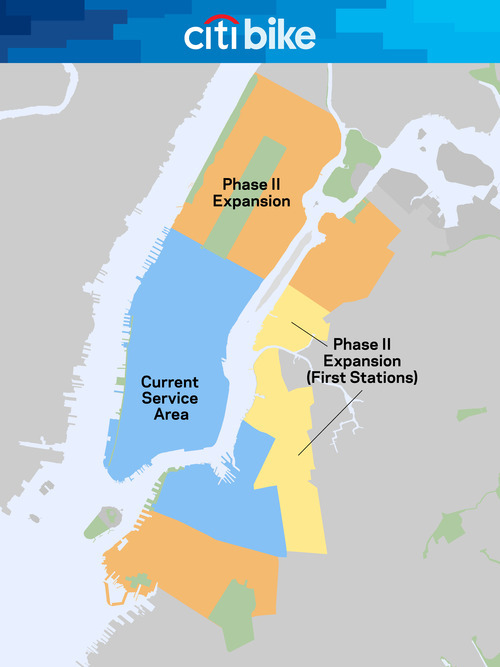 DOT Commissioner Polly Trottenberg said the agency will begin the process of public outreach to determine where stations should go in the new neighborhoods, working with residents, elected officials, community boards and local organizations, she said. People can also suggest docking locations through the DOT's website. A date for when the membership price hike will take effect will be announced soon. Discounted memberships for NYCHA residents will still cost $60, and Citi Bike is looking into possible weekend, monthly and tourist memberships, according to officials. Funding for the program will also come from Citigroup, which is extending its sponsorship of Citi Bike through 2024 and providing $70.5 million, officials said. Additional funds are coming from Goldman Sachs Urban Investment Group and The Partnership Fund for New York City. Bike Share Holdings LLC, the group that acquired Alta Bicycle Share, includes Harvey Spevak, CEO of the gym chain Equinox, Jeff Blau of Related Companies and investor Jonathan Schulhof, according to a press release.